HIGH RENTS, A lack of staff and tough competition from incumbents are all hurdles that the latest fast-food chain looking to set up in Dublin will have to overcome. This is according to Stuart Fitzgerald, the Waterford accountant who is bringing UK-based franchise Leon – which trades on its ‘health’ food credentials – to the Irish capital as the first step in a planned expansion across the country. “There’s huge opportunities but there’s a lot of great operators here already and we’re all competing for the same consumers. And rents in Dublin are now as high as London,” Fitzgerald told Fora. Earlier this summer it was revealed that Fitzgerald and his business partner Brian McIntyre had secured a franchise agreement for Leon to bring the concept to the local market. The chain is already well-known in the UK for offering heath-focused meals – such as halloumi wraps, vegan meatballs and gluten-free chicken nuggets – but in a fast food setting. The first Leon outlet in Dublin was due to open later this year but Fitzgerald said that a few issues delayed that plan. “We were close but it’s just taken a little bit more time than we thought to finish the process. Trying to get a lease agreed over the summer when people are on holidays is always an issue. Fitzgerald said that he will be focusing on Dublin “for the first two to three years”, looking for standalone locations that are “a bit iconic” as Leon isn’t a “cookie cutter” chain. Fitzgerald spoke to Fora at the Food & Drink Business Conference in Dublin this week, where he laid out his plans for the expansion of the Leon brand in Ireland. After Dublin, he said that his firm will look at other cities such as Cork, Galway and Limerick, with plans to open a total of 20 outlets in the next five years. After that, he intends to “take stock and determine where to go next”. 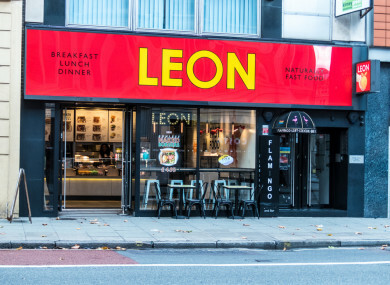 Despite the strong competition in Irish cities – from salad bars to burrito chains – he said that there is a gap for a “unique brand” such as Leon. “It has a very broad appeal – it’s not just salads and it’s not just fast food. We do breakfast, lunch and dinner, bringing in vegan, gluten-free food and natural ingredients. UK-based Leon was founded in 2004 by John Vincent, Henry Dimbleby and Allegra McEvedy. The chain now has 57 restaurants – most of which are in London and other UK cities – but it also has outlets in Amsterdam, Utrecht, Oslo, Gran Canaria and Washington DC. Last year, the company reported sales of more than £58 million after ramping up its expansion plans. Email “Fast-food chain Leon sees 'huge' opportunities in Dublin - despite tough competition and high rent”. Feedback on “Fast-food chain Leon sees 'huge' opportunities in Dublin - despite tough competition and high rent”.